I do 90% of my grocery shopping at the Green City Market. I enjoy walking around tasting every blueberry before I purchase the sweetest. I know that in the grand scheme of things, I’m lucky in my eating habits: I have no other mouths to feed, I can afford to pay market prices, and my schedule allows time to cook instead of relying on whatever’s near and quick. Many aren't so fortunate: 1 in 4 families in the Chicago area live below the poverty line, and more than 12 millions kids in the US have limited access to the nutritious foods that are so important for healthy development. Last Thursday evening I attended Taste of the Nation- Share Our Strength's traveling fundraiser which brings together top culinary talent at over 45 events across the US and Canada. 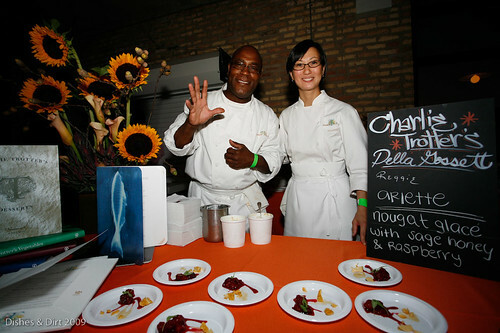 Chicago’s event, held at the Ravenswood Billboard Factory was chaired by Pastry Chef Mindy Segal and benefited the Chicago Greater Food Depository, Illinois Hunger Coalition, and Near North Health Service Corporation. The event spanned a food pyramid of three floors. The first floor was an expanse of food & booze. The second- Cheese & Desserts (aka Sugar Coma Floor), and the third, well, more fine fine drinks. What a world. Bistro Campagne’s duck confit with Klug Farms peach compote, Hot Chocolate’s braised goat & corn chowder, and Sola's miso cod with spicy greens, radishes, and a crispy slice of lotus root. As far as drink options go, Adam Segar’s raspberry negroni was right up my alley. (And I can’t wait to head to Nacional 27 to sample the ground cherry cocktail he described.) And I always enjoy the Goose Island beer and culinary pairings. Hoosier Mama had cherry pie on a stick (who knew?!) and there were the most euphoric little chocolate desserts from Sofitel. Della Gosset of Charlie Trotter's nougat ice cream with honey comb, raspberries, and fresh sage- was an experience onto itself. An unbelievable experience, though its a bit strange to focus on hunger through indulgence. But the reality is that the culinary world is really the driving force of change - especially here in the the chicago area. I volunteer with Common Threads, a non-profit founded by Art Smith focusing on teaching lower income kids about food and cooking. These kind of programs help to bridge the gap between a $100 a head indulgent benefit dinner and working with organizations who make change happen where the rubber meets the road.